These industrial and event spaces becoming increasingly popular as alternative venues for weddings and other social events. When guests arrived at singer Amanda Lee and finance manager Tan Yao Zong’s wedding venue in July 2018, they found themselves not at a swanky hotel, but in the middle of an industrial park in Tai Seng. Instead of a million-dollar view of gleaming skyscrapers in the city, guests looked out to construction tower cranes and big trucks parked amid factory lots and warehouses. But what lay within the venue on the third floor of the Goodland Group Building on Kim Chuan Lane, where the couple said “I do”, was a completely different look and vibe. Guests walked into a room filled with lush plants and took their seats on white Tiffany chairs, set up in rows in front of the floor-to-ceiling windows that let plenty of natural light into the corner warehouse unit. “I chose this place because it has an industrial feel, but is still classy. It also has a high ceiling which I like,” says Amanda, 33, who emcees and sings at weddings. The couple hosted 80 guests that Saturday and paid $800 for the venue and an additional $1,600 for the decor, flowers and chair rental. The buffet reception, video and photography were separate costs. “In hindsight, I wouldn’t say I saved money by choosing to do our solemnisation this way. It actually took more work to set it up, but it was a unique wedding experience and the guests really liked it,” she says. Her bold choice of a venue is just one example of industrial spaces becoming increasingly popular as venues for social events. Unlike function rooms and club houses in condominiums or expensive hotel ballrooms, these rent-able spaces are great for hosting large groups and are private enough so you feel exclusive. Plus, no fighting for carpark space with the masses in town. On event venue marketplace Venuerific, which lists 162 venues for event rental in Singapore, the most popular are in different or less accessible locations such as industrial parks and even Sentosa Cove. “The usual way is to have events at hotels and restaurants and, while they can be really nicely set up, if you have been there many times, you lose the element of finding something unexpected,” says co-founder Ricardo Sentosa, 35. While hotels and restaurants used to dominate the scene, he has seen a slowing demand in recent years, with more people turning to up-and-coming players that can better cater to their needs and fit their budget for small social events such as baby showers and birthday parties. The average venue rental cost for 50 people or fewer on Venuerific ranges from $500 to $1,000. Ricardo says venues tend to tag on an additional 20 per cent for corporate events and weddings. “Smaller event spaces offer a kind of flexibility that hotels and restaurants cannot because they are hungry for business and will do the best they can to satisfy the customers’ needs,” he adds. 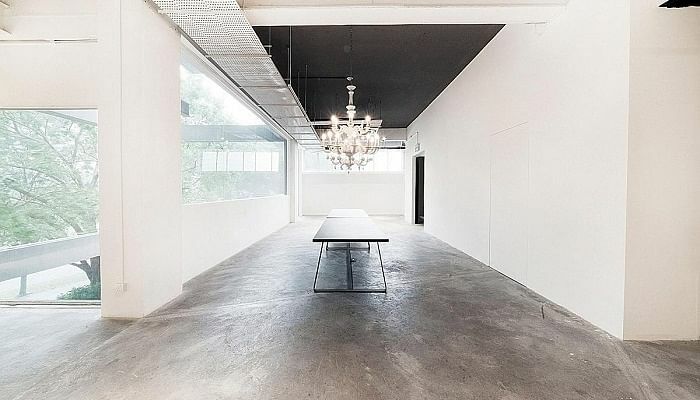 For the boutique creative agency that owns this 1,722 sq ft venue, the decision to rent out its office was not a hard one to make. Chun Tsubaki's five employees are out on most days and people were constantly asking about renting its space after seeing photos of it on social media. In the space is a fully functional there is a kitchen island that is moveable along with other modular elements such as a concrete-like wall on wheels, which doubles as a photo-booth backdrop or projector screen. The space has been rented out two or three times a week since May last year, with hourly rates starting at $150 on weekdays and $180 on weekends. The income from this helps the company offset its rental costs. The biggest downside of the location, Amanda says, was the lack of parking. Her guests had to find alternative places in the vicinity to park or give up driving altogether. But often, the aesthetics and the uniqueness of such a venue can more than make up for the inconvenience. Venuerific's most asked about venue last year was an event space on the second floor in Jalan Kilang, in an industrial park in Bukit Merah. Cloud9, which opened in August last year, received 696 inquiries, of which half became actual bookings, mainly for social events. There are plenty of entertainment options in the 2,200 sq ft space, including a karaoke set, virtual-reality set, foosball table, arcade console, pool table and board games. Co-founder Charmine Yee, 27, says: "It's a place where guests can amuse themselves and it saves the event organiser from having to come up with a programme." Agency development executive Melody Chow, 30, held two company events - a formal goal-setting session and a Christmas party at Cloud9. 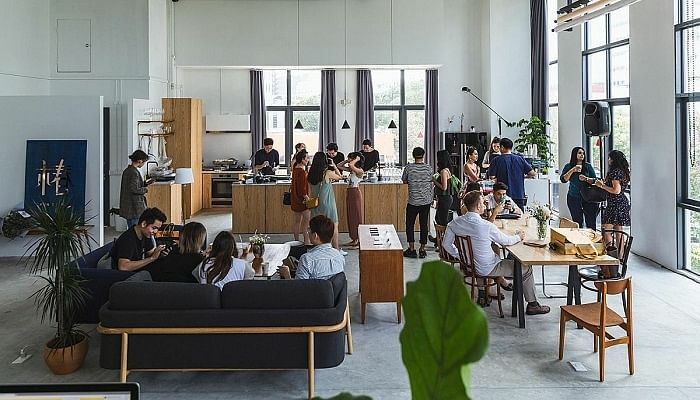 "Because the space rental cost was within budget and covered the entertainment, we could afford to splurge more on food and drinks", says Melody, who paid $600 to rent the space for 90 people for five hours, which she says was worth it. Event spaces that do not provide entertainment and food-and-beverage amenities typically have add-on event planning and catering options to simplify the planning process for clients. 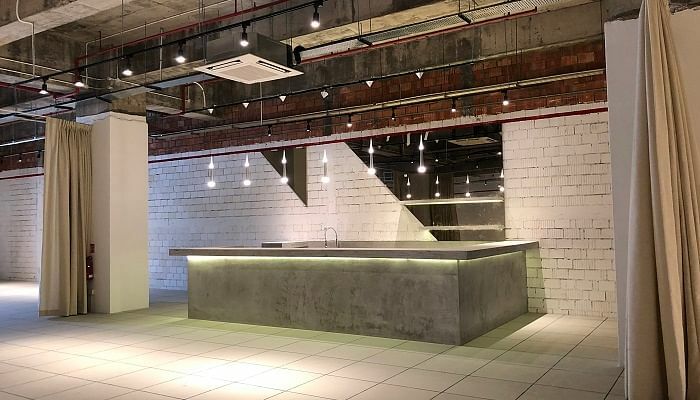 Maison Miaja's event space, on the second floor of APS Building on Muthuraman Chetty Road in Robertson Quay, offers a list of vendors for food and drink, florists and DJs. One of the chefs Maison Miaja partners with is French chef Bruno Menard. The 3,390 sq ft space is a contemporary art gallery when it is not being rented out, making it ideal for upmarket events such as luxury brands' product launches and fine-dining dinners. Guests can keep the artworks and digital installations in the space or have them removed completely. The fee averages around $6,000 for a nine-hour, full-day rental on a weekday, excluding catering and decor. The space has standing room for up to 250. 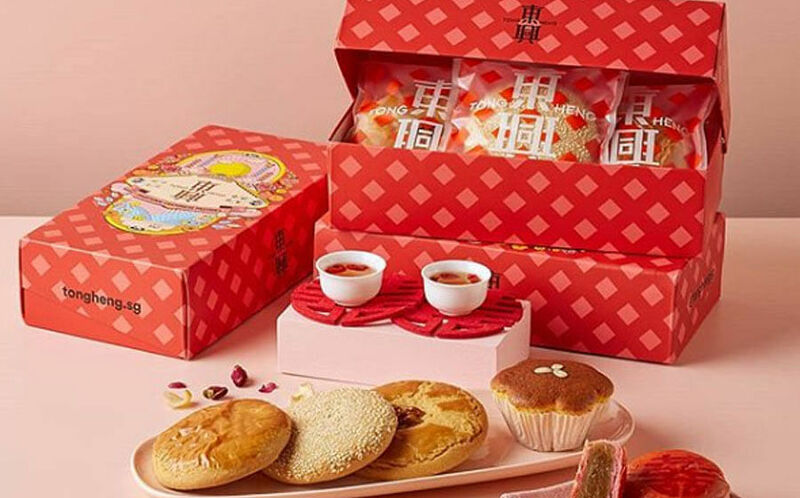 Its 31-year-old brand development manager, Yuching Teng, says: "The versatility of the space means that we can cater to different needs. We're not like a restaurant, but we can provide the experience a restaurant offers while still keeping it special and exclusive. 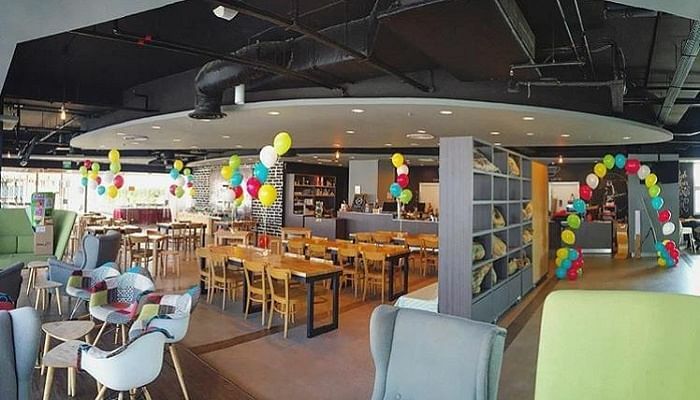 This rooftop cafe tucked away in Kallang's Pico Creative Centre boasts sweeping panoramic views, a rooftop garden and 4,200 sq ft of indoor space for a big private party. It's got friendly vibes with tons of seating options, and they can even tailor an event package to suit your needs and preferences. Plus, it's a cafe so you won't have to worry about catering food from elsewhere. Besides buffet packages and gourmet cakes and drinks, the cafe also specialises in delicious peranakan cuisine as well as western fare like burgers and pizzas. 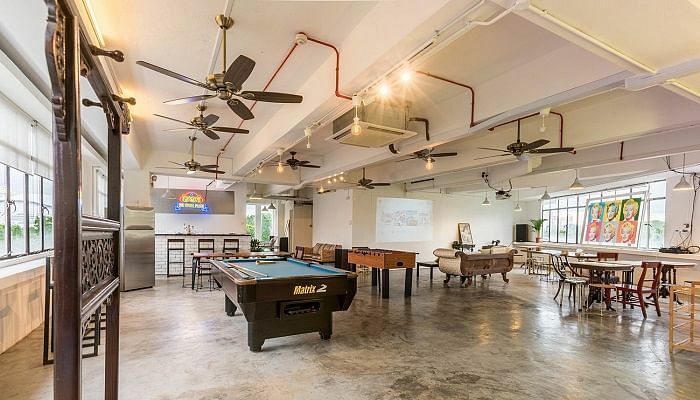 Also located in Kallang, this rustic 2,200 sq ft event space takes you back to the good old days. 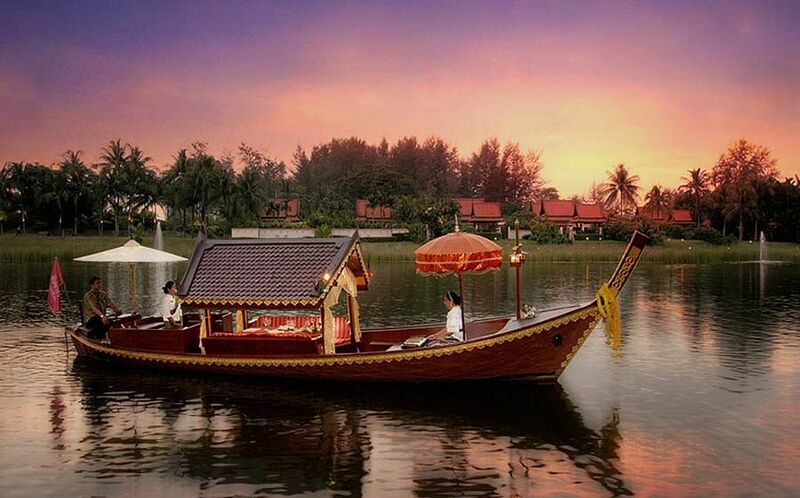 A private lift which takes you up to the venue provides an added touch of exclusivity. There's an arcade machine, karaoke, board games, pool and foosball tables and something to ensure young ones will never be bored - Nintendo Switch! Where: It's so secret, you'll need to contact them for the exact location, but it's an 8-minute stroll from Lavender MRT. This spacious 5,400 sq ft industrial-looking space hidden away in an Ang Mo Kio industrial park is great for hosting a large party of up to 400 guests. There's a curtain for dramatic effect, which reveals a gorgeous concrete bar counter that your guests will go crazy over. This story was first published in The Singapore Women's Weekly. 8 sky high wedding venues!